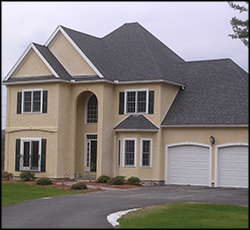 Our custom stucco systems give your home or business the elegant look of a stucco finish, without the expensive construction or maintenance costs. Stucco veneer is an extremely durable, premium 3 coat veneer system. The final coat is made from a thin coating of masonry, textured to create the finish of your choice. Stucco can be applied over nearly any existing wall or exterior finish saving money on expensive removal costs. 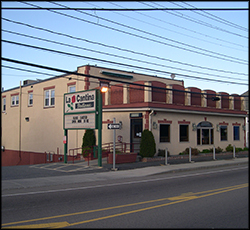 Adding stucco gives a classic look to any style of residential or commercial building. Stucco offers higher durability than other exteriors. Our stucco veneer has the same durability as concrete. It has a 40 year proven track record to stand up to the harsh New England climate. With stucco there is no need to worry about water damage due to water pooling in the joints and freezing, or the color fading over time. Because stucco is maintenance free, you never have to worry about water damage, joints popping or shifting over time. Our systems stand up against the harshest weather conditions. Our stucco veneers do not require expensive footings, ensuring a low cost of installation. The stucco veneer can be applied over almost any existing wall or exterior finish –– saving you money on expensive removal costs. Our stucco provides design flexibility with over 12 different colors to choose from and multiple finishes available. Color combinations and patterns are versatile so we can match your existing surfaces, allowing for savings because you replace only what you need too. Our stucco veneer systems can be combined with other traditional exteriors to give your home a stunning look that is guaranteed to last. 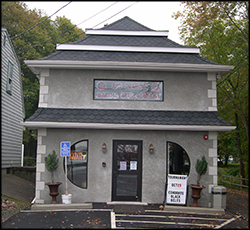 For more information on our stucco systems from the experts at New England Brickface, please contact us here or call us directly at 508.400.1241.